It has been one of the most pressing unanswered questions in public health: Do e-cigarettes actually help smokers quit? Now, the first, large rigorous assessment offers an unequivocal answer: yes. The study, published Wednesday in the New England Journal of Medicine, found that e-cigarettes were nearly twice as effective as conventional nicotine replacement products, like patches and gum, for quitting smoking. The success rate was still low — 18 percent among the e-cigarette group, compared to 9.9 percent among those using traditional nicotine replacement therapy — but many researchers who study tobacco and nicotine said it gave them the clear evidence they had been looking for. The study was conducted in Britain and funded by the National Institute for Health Research and Cancer Research UK. For a year, it followed 886 smokers assigned randomly to use either e-cigarettes or traditional nicotine replacement therapies. Both groups also participated in at least four weekly counseling sessions, an element regarded as critical for success. The findings could give some new legitimacy to e-cigarette companies like Juul, which have been under fire from the government and the public for contributing to what the Food and Drug Administration has called an epidemic of vaping among teenagers. But they could also exacerbate the difficulty of keeping the devices away from young people who have never smoked while making them available for clinical use. “There is an unavoidable tension between protecting kids from e-cigarettes and smoking cessation, which is also very important,” Dr. Benowitz said. Tobacco use causes nearly 6 million deaths worldwide each year, including 480,000 in the United States, according to the Centers for Disease Control and Prevention. If tobacco use trends continue, the global death tally is projected to reach 8 million deaths annually by 2030. E-cigarettes provide the nicotine smokers crave without the toxic tar and carcinogens that come from inhaling burning tobacco. But regulators in the United States, Britain and elsewhere have not approved them to be marketed as smoking cessation tools. The New England Journal devoted much of its current issue to e-cigarettes, publishing two editorials and a letter, and the collection embodies the tangled public health debate over the devices. One editorial — written by Belinda Borrelli, a behavioral health expert and Dr. George T. O’Connor, a pulmonologist — pumped the brakes on inclinations to embrace e-cigarettes. They noted that 80 percent of the study participants who had quit by using e-cigarettes were still vaping at one year, while only nine percent of the nicotine replacement therapy group was still using nicotine products. That raised concerns, they wrote, about sustained nicotine addiction and the unknown health consequences of long-term e-cigarette use. The editorial recommended that e-cigarettes be taken up when other cessation approaches, including behavioral counseling, have failed; that patients use the lowest dose of nicotine possible; that health care providers establish a clear timeline for e-cigarette use. Another editorial implored the Food and Drug Administration to ban all nicotine flavors for vaping devices because of their appeal to adolescents. The clinical trial took place from May 2015 to February 2018. Because the smokers were recruited at the clinics, they were already predisposed to quitting, a feather on the scale that could slightly have affected results. The participants were typically middle-aged, smoked between half a pack and a pack a day and had already tried quitting. The e-cigarette subjects were given a starter kit with a refillable device and one bottle of tobacco-flavored nicotine e-liquid, with 18 milligrams per milliliter — the most common product in England. All the participants had individual latitude within their study groups to closely approximate real-life scenarios. When the vapers finished their bottle of nicotine liquid, they could choose whichever flavor and nicotine strength to purchase. The people using nicotine replacement therapy could select from an array of products, including the patch, gum, lozenge and nasal spray. They were even encouraged to combine them; most did so, typically opting for the patch and an oral therapy. Because self-reports of smoking abstinence are not considered reliable, researchers measured the quantities of carbon monoxide in the participants’ breath, a more precise validation. Dr. Benowitz noted that the higher quit rates and compliance among e-cigarette users could be additionally explained because those subjects expressed more satisfaction with the devices than did the other group with their products. In their editorial, Drs. Borrelli and O’Connor pointed to other research on smoking cessation therapies: In one study nicotine-replacement therapy and the antidepressant buproprion (Wellbutrin) achieved slightly higher abstinence rates than did e-cigarettes in this latest trial. The prescription drug varenicline (Chantix) has performed even moderately better. Moreover, these products have been proven safe, they said. 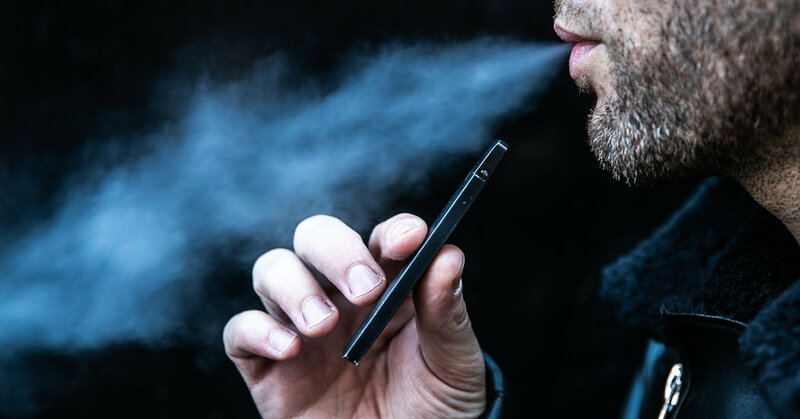 Particularly for American vapers who have embraced the e-cigarette Juul, with its higher levels of nicotine, one outstanding question is whether such a product would be even more effective at smoking cessation. Some researchers hypothesize that because a body takes in only the amount of nicotine it needs to maintain a certain level, high-nicotine products like Juul could have the advantage of delivering that power punch with fewer puffs, decreasing the amount of harmful aerosol a vaper would inhale. But Risa Robinson, a professor of mechanical engineering and director of respiratory technology at Rochester Institute of Technology, expressed worries about emerging studies showing harmful effects of nicotine. Such worries prompted a letter published in the same journal about teenage vaping in Colorado, which led the country in underage use in 2017.